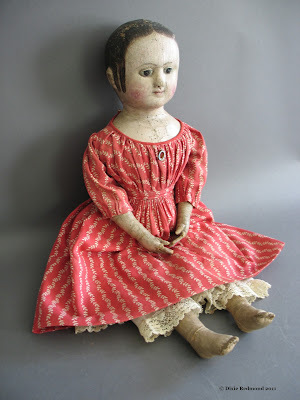 There are many wonderful past dollmakers that we dollmakers like to emulate. Emma Adams, Ella Smith, Julia Beecher, Martha Chase are examples. But no other dollmaker inspires like Izannah Walker. There is something about studying a master that informs your own independent creations. 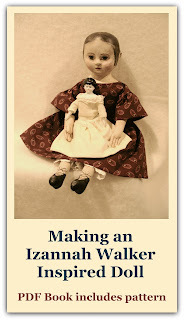 The Coffee with Tea Ebay group had a challenge to make an Izannah Walker inspired doll that is under 8 inches tall. All of you dollmakers out there know what a feat that is! Smaller is not easier. I am so impressed with the creativity of the dolls that came from this challenge. Click the links or pictures to see what each dollmaker has made. If I had the discretionary income at this time, I would buy every one of these beauties and line them up. They would be wonderful displayed as a group! Dixie, thank you sooo much for showing our dolls on this wonderful blog that gives so much inspiration to so many of us ! Hi Dixie. Do you remember me? It's Car from ECP, a few years back. I enjoyed visiting your site today and loved seeing your doll. She has a very sweet face. Nancy's is so sweet too and also Lone. Everyone did a beautiful job reproducing them, and I just wanted to tell you.